The American Academy of Ophthalmology Preferred Practice Patterns defines cystoid macular edema (CME) as retinal thickening of the macula due to a disruption of the normal blood–retinal barrier. It represents a common pathologic sequel of the retina and occurs in a variety of pathological conditions such as intraocular inflammation, central or branch retinal vein occlusion, diabetic retinopathy, and most commonly following cataract extraction. Most of the intraocular procedures are associated with the development of CME with varying incidence such as visually significant CME in 0.1%–2.35% of cataract surgery, 9.5%–36% after keratoplasty, and 5.5% cases of pars plana vitrectomy. Various factors have been implicated with the development of these postsurgical CME such as inflammation, vascular instability, and vitreomacular traction. They lead to disruption of blood–retinal barrier and accumulation of fluid between outer plexiform layer (OPL) and inner nuclear layer. CME is one of the important causes of decreased visual acuity in a patient of keratoplasty, along with astigmatism, graft clarity, and postoperative glaucoma. Incidence of CME is difficult to assess in keratoplasty patients due to lack of preoperative media clarity in majority and is very much dependent on status of corneal graft after the surgery. The traditional method of diagnosing CME with fundus fluorescence angiography has largely been replaced by optical coherence tomography (OCT) due to its noninvasive nature, high accuracy, and reproducibility. It gives high-resolution cross-sectional image of the retina without any discomfort to the patient which is important in taking serial images. It gives direct measurement of retinal thickness with depiction of intraretinal cysts in OPL along with other vitreomacular abnormalities. The normal reported foveal thickness by Stratus OCT (OCT3) is 212 ± 20 μ. A hospital-based prospective study was conducted on 16 eyes of 16 consecutive patients who were enrolled after necessary ethical clearance fulfilling the inclusion and exclusion criteria. These patients underwent optical penetrating keratoplasty (PKP) at Rajendra Nagar Superspeciality Eye Hospital, Patna, Bihar, between April 2015 and September 2016. Patients of PKP with clear media adequate to perform OCT for central macular thickness (CMT) analysis were included. Patients with systemic conditions such as diabetes mellitus or hypertension, or ocular pathologies other than the primary indication of surgery, affecting macular thickness were not included in the study. Any patient with a graft rejection episode within 3 months of surgery was also excluded from the study. Anterior segment evaluation was done including best-corrected visual acuity (BCVA) measurement, slit lamp biomicroscopy, intraocular pressure (IOP) measurement with noncontact tonometry, or digital palpation method. Posterior segment examination was done with ultrasonography B-scan when fundus view was restricted. Preoperative OCT scan was not possible due to lack of media clarity. 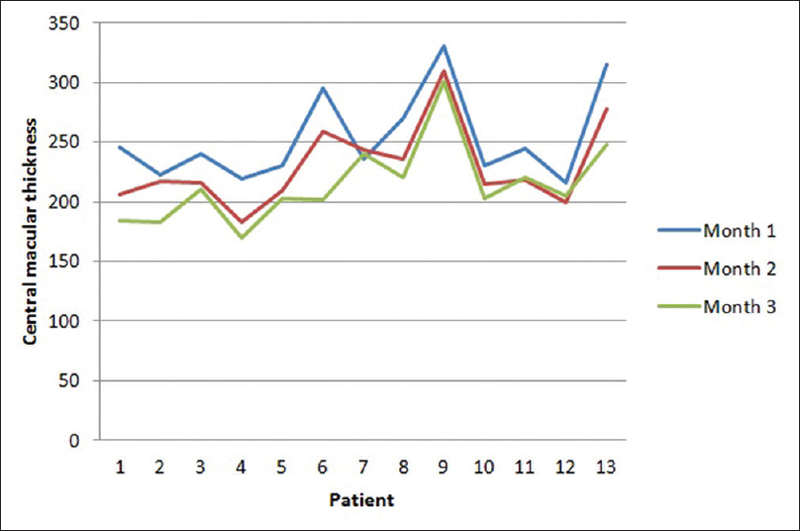 All the patients received intravenous mannitol 20% (1 g/kg body weight) 1 h before surgery. All surgeries were performed under peribulbar anesthesia. PKP was performed in 11 cases by the standard surgical procedure keeping donor graft 0.5 mm larger than the trephinated host cornea. Sixteen interrupted 10-0 monofilament nylon sutures were placed radially to secure the graft–host junction. Anterior chamber was well formed at the end of procedure. Triple procedure was done in two cases where cataract removal and intraocular lens (IOL) implantation was combined with keratoplasty. None of them had any vitreous disturbance during surgery. Among the pseudophakic bullous keratopathy (PBK) patients, IOL was seen either in the sulcus or in the capsular bag. It was left in situ and was not manipulated in any way. In one of the patients, vitreous tag was noticed which was managed by open-sky vitrectomy. All the patients received systemic steroid (oral tablet prednisolone– 1 mg/kg body weight-tapering dose for 2 weeks), topical antibiotic (for a month), topical steroid (long tapered course), topical cycloplegic (1 week), and antiglaucoma drugs wherever required. None of the patients was given any additional medication for macular pathology. At every visit, BCVA measurement, IOP measurement, and graft status were checked. The postoperative CMT measurement was done with OCT (Stratus OCT 3, Carl Zeiss Meditec, Inc., Dublin, CA) using the macular thickness map scan protocol at the end of 1st, 2nd, and 3rd month. In this study, we have considered CMT as the average thickness of central 1 mm area and CME as CMT >250 μ, loss of normal foveal contour, and cystoid changes in the central macula. The change in CMT was assessed over a period of 3 months, and the statistical analysis was done using two-tailed paired t-test. Out of 16 patients, 13 completed the study. Two patients were excluded due to lack of media clarity and one due to lost follow-up. Hence, the final study group had 13 patients, six cases of corneal opacity and seven cases of PBK. A total of 13 eyes undergoing PKP were included in the study. The mean age of this study group comprising 13 patients was 53.92 years with a standard deviation of 19.16 (range 22–75 years). There were two primary indications – six cases of corneal opacity and seven cases of PBK. Two of these 13 patients underwent triple procedure. The CMT at the end of month 1, 2, and 3 was 253.46 ± 37.50 μ, 230 ± 34.89 μ, and 214.53 ± 33.84 μ, respectively [Figure 1]. The statistical difference between 1st and 2nd month and between 2nd and 3rd month was very significant (P< 0.00004 and 0.006, respectively). 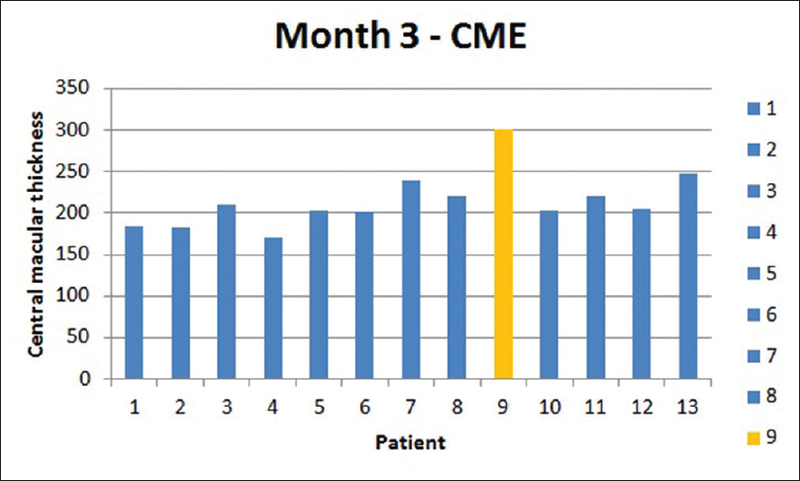 Four out of 13 patients (30.7%) had CME at the end of month 1; at the end of month 3, three out of 13 patients (23.07%) had it; at the end of month 3, only one of the patient (7.69%) had CME as defined in this study [Figure 2],[Figure 3],[Figure 4]. When we compared the primary indication of surgery and presence of macular edema, we found that 42.85% of PBK patients had CME at any point of follow-up whereas only 16.66% cases of corneal opacity had CME. Triple procedure is associated with higher macular thickness at every point of time during follow-up in comparison to simple keratoplasty, but this difference was not significant statistically. In our study, we have noted that the CMT at the end of month 1, 2, and 3 was 253.46 ± 37.50 μ, 230 ± 34.89 μ, and 214.53 ± 33.84 μ, respectively. The change in macular thickness was significant between month 1, 2, and 3. There is a gradual natural decline in CMT with the routine postoperative medication of PKP, which contains systemic and topical corticosteroids. Patients who had CME at month 1 had not been given any separate medication. This is similar to other studies published on CMT analysis after PKP , who showed a gradual decrease in macular thickness over months. 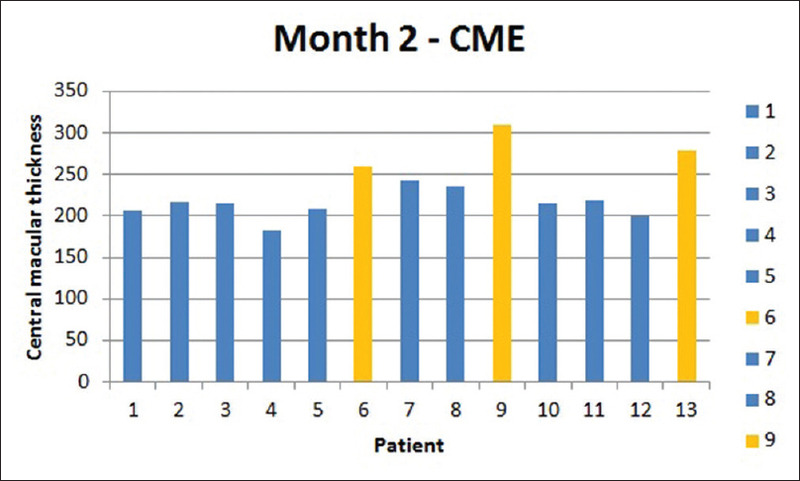 The overall prevalence of CME in our study was 30.7% at the end of the 1st month. 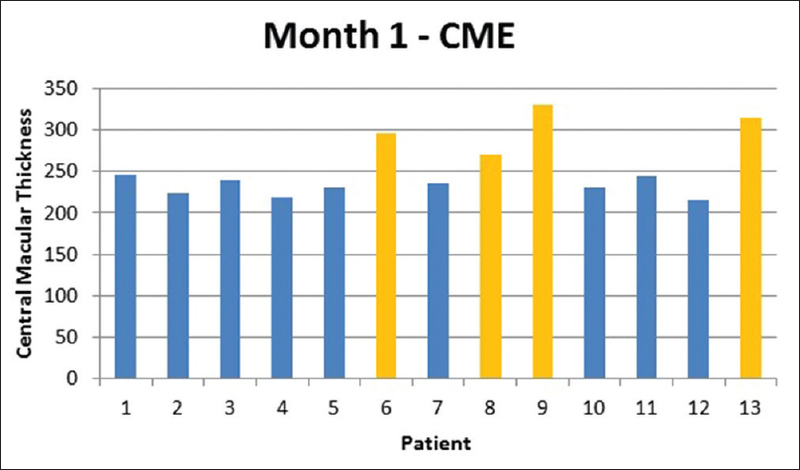 Three out of seven patients of PBK (42.85%) had CME at the end of month 1, while only one out of six patients of corneal opacity (16.66%) had it. Here, we cannot rule out preexisting CME as preoperative OCT was not possible due to media opacity. This is in accordance with the study by Sugar, who reported 36% incidence of macular edema in 469 cases of PBK undergoing PKP. However, a very different result was published by Genevois et al., who reported 9.6% incidence of macular edema. This difference is most probably due to difference in study group. We had two well-defined indications of surgery, PBK and corneal opacity, while in Genevois et al. 's study, there were multiple indications of keratoplasty such as keratoconus, PBK, Fuch's endothelial dystrophy, herpetic keratitis scar, and repeat graft. If we consider cases of herpetic keratitis scar undergoing keratoplasty in their study, the incidence of macular edema was 50%. Koytak et al. in their study have published an incidence of 9.4% of macular edema after PKP for patients of keratoconus. This could be again due to different primary indication of surgery and lower mean age group of patients. Acar et al. in their study comparing results of PKP and deep anterior lamellar keratoplasty for patients of keratoconus reported 30% incidence of macular edema, but they had preoperative macular thickness measured and their criteria of defining macular edema were different from our study [Table 1]. Triple procedure, especially associated with disturbance of vitreous and transpupillary anterior vitrectomy, has been reported with higher postoperative persistent CME (33%) as compared to no vitreous manipulations (4%). Two of the triple procedure patient in our study had higher CMT which was not significantly different from other PKP patients. None of these patients had vitreous manipulation during surgery. This is in contrast with the report by Genevois et al. who stated that combined surgery is associated with significantly higher incidence of macular edema. However, their study did not give details of vitreous disturbance or details of tissue manipulation during combined procedure. Our study has some major drawbacks. The most important limitation is its small sample size. Others are shorter follow-up and lack of baseline preoperative CMT to compare. This study shows a natural decline in CMT and prevalence of macular edema with time. The prevalence of CME after PKP is 30.7% in our study, but there is a gradual decrease with the routine postoperative medication of PKP. Hence, not every case of diagnosed macular edema needs to be treated very aggressively. This is especially important in cases of PKP where postoperative visual gain is majorly governed by graft status and amount of astigmatism. Triple procedure without vitreous manipulations has no separate implication on incidence of CME than a routine PKP. Rotsos TG, Moschos MM. Cystoid macular edema. Clin Ophthalmol 2008;2:919-30. Wetzig PC, Thatcher DB, Christiansen JM. The intracapsular versus the extracapsular cataract technique in relationship to retinal problems. Trans Am Ophthalmol Soc 1979;77:339-47. Koytak A, Kubaloglu A, Sari ES, Atakan M, Culfa S, Ozerturk Y, et al. Changes in central macular thickness after uncomplicated corneal transplantation for keratoconus: Penetrating keratoplasty versus deep anterior lamellar keratoplasty. Cornea 2011;30:1318-21.
de Nie KF, Crama N, Tilanus MA, Klevering BJ, Boon CJ. Pars plana vitrectomy for disturbing primary vitreous floaters: Clinical outcome and patient satisfaction. Graefes Arch Clin Exp Ophthalmol 2013;251:1373-82. Schanzlin DJ, Robin JB, Gomej DS, Gindi JJ, Smith RE. Results of Penetrating Keratoplasty for aphakic and pseudophakic bullous keratopathy. Am J Ophthalmol. 1984;98:302-12. Fu A, Bui A, Roe R, Ahmed I. Yanoff and Duker: Ophthalmology. 3rd ed. New York: Mosby; 2008. Nagpal M, Nagpal K, Nagpal PN. Postcataract cystoid macular edema. Ophthalmol Clin North Am 2001;14:651-9, ix. Kramer SG. Cystoid macular edema after aphakic penetrating keratoplasty. Ophthalmology 1981;88:782-7. Waring GO 3rd, Stulting RD, Street D. Penetrating keratoplasty for pseudophakic corneal edema with exchange of intraocular lenses. Arch Ophthalmol 1987;105:58-62. Holland EJ, Daya SM, Evangelista A, Ketcham JM, Lubniewski AJ, Doughman DJ, et al. Penetrating keratoplasty and transscleral fixation of posterior chamber lens. Am J Ophthalmol 1992;114:182-7. Insler MS, Kook MS, Kaufman HE. Penetrating keratoplasty for pseudophakic bullous keratopathy associated with semiflexible, closed-loop anterior chamber intraocular lenses. Am J Ophthalmol 1989;107:252-6. Schanzlin DJ, Robin JB, Gomez DS, Gindi JJ, Smith RE. Results of penetrating keratoplasty for aphakic and pseudophakic bullous keratopathy. Am J Ophthalmol 1984;98:302-12.
van der Schaft TL, van Rij G, Renardel de Lavalette JG, Beekhuis WH. Results of penetrating keratoplasty for pseudophakic bullous keratopathy with the exchange of an intraocular lens. Br J Ophthalmol 1989;73:704-8. Genevois O, Benzerroug M, Gardea E, Brasseur G, Muraine M. Macular edema after corneal graft: A prospective study by optical coherence tomography. Cornea 2007;26:683-4. Sugar A. An analysis of corneal endothelial and graft survival in pseudophakic bullous keratopathy. Trans Am Ophthalmol Soc 1989;87:762-801. Acar BT, Muftuoglu O, Acar S. Comparison of macular thickness measured by optical coherence tomography after deep anterior lamellar keratoplasty and penetrating keratoplasty. Am J Ophthalmol 2011;152:756-61.e2.